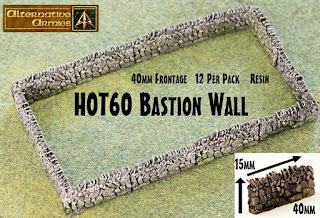 Back at Alternative Armies in the 15mm HOT Range the second of five packs of now in resin 40mm frontage scenics. Excellent for use in 15mm scale in systems such as HOTT for strongholds or outer defences and such or in wargaming in general. Once they were white metal and now they are resin and a dozen to the pack. Superb! Go HERE for the HOT Range or read on for more information. This pack contains twelve identical resin pieces of a 'dry stone style' wall which is 40mm long and 16mm tall. 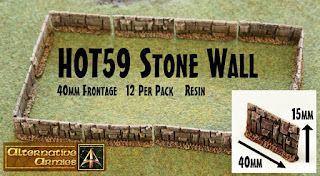 You can assemble 480mm of frontage (19.2 Inches) with this pack and they can be used in 15mm or 28mm scale for a head height or knee height structure. Form walls, field enclosures and more. Useful in HOTT 2nd Edition to make a stronghold for your army. 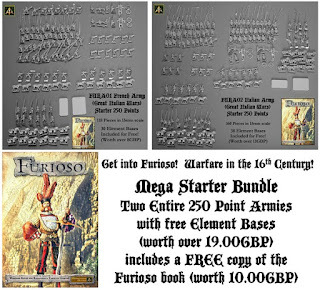 Can be used in Furioso or DBA, DBM and such games. Go HERE. 5.00GBP per pack. Above are more images of HOT60 as well as a photo with MRC17 Late 16th Century Cavalry Command for scale plus MR34 and 5024 in 28mm. Here are the other HOT Wall scenic codes on the website now. 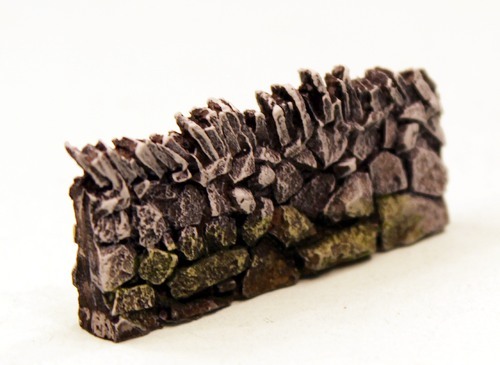 This pack contains twelve identical resin pieces each a stone wall which is 40mm long and 15mm tall. You can assemble 480mm of frontage with this pack and they can be used in 15mm or 28mm scale for a head height or knee height structure. Form walls, field enclosures and more. Useful in HOTT 2nd Edition to make a stronghold for your army. 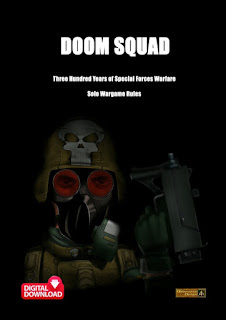 Can be used in Furioso or DBA, DBM and such games. Go HERE. 5.00GBP per pack. 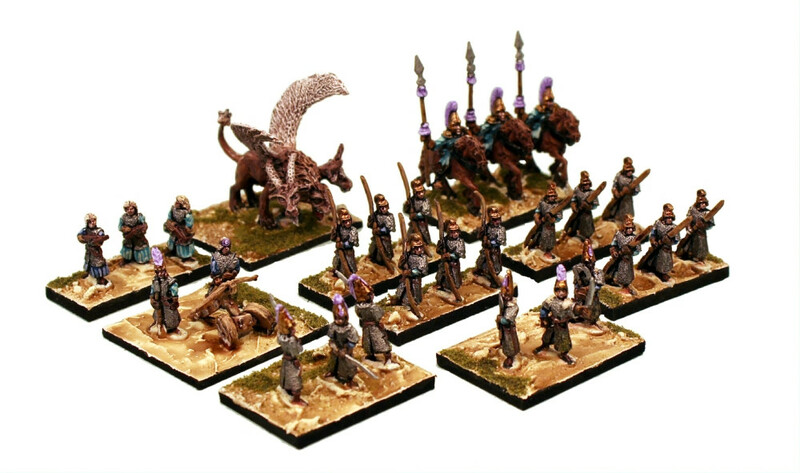 We have a large range of 24AP pre-made armies for HOTT which you can see HERE. All the miniatures and element bases included. 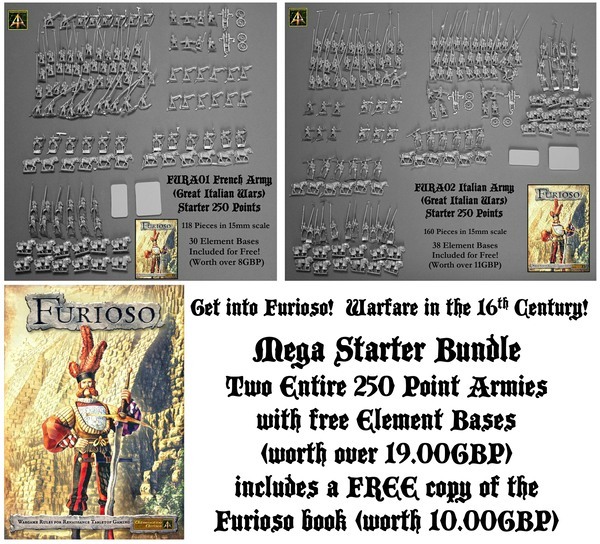 We have a full range of miniatures and some pre-made armies for Furioso. 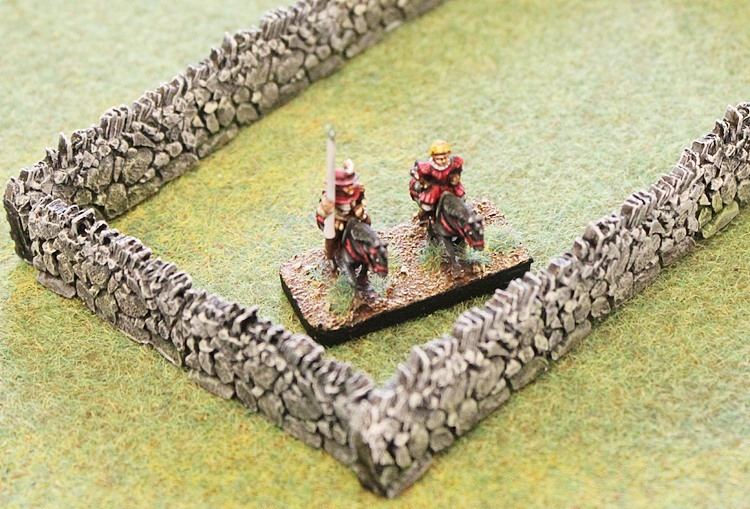 See them all HERE if you enjoy 15mm scale Renaissance warfare. FL29 Mischief of Rats scurrying out now! OH32 Goblin Knight Bolt Thrower released!